'Everybody is using everything they can' to find and keep workers, including modifying jobs for retirement-bound baby boomers. On the surface, Maine’s labor pool looks like a puddle of stagnant water. Unemployment is at historically low levels, and only 100 new jobs are projected through 2026 statewide, creating an impression of a withering Maine economy. But that placid surface is deceiving, say recruiters, staffing agencies and state officials. Just under the surface is churn – the constant mix of people starting new jobs and others leaving – that is creating opportunities for job seekers and headaches for employers. 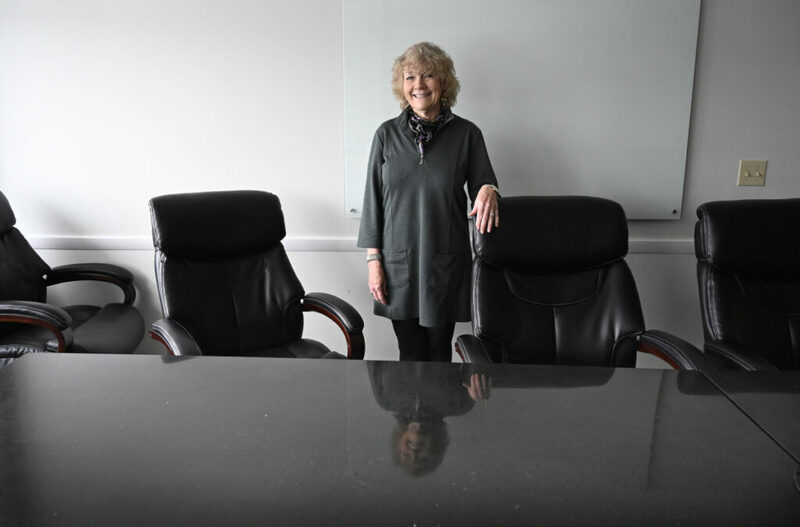 To help bridge the gap, businesses are increasingly turning to older workers, especially baby boomers – people born between 1946 and 1964 – who in other eras would be in or nearing retirement by now. Some staffing services have launched services to help match older prospects with new jobs. Others are offering advice on how to make your new hire – age 60-something – fit in with the rest of the staff. For Olken, flexible schedules are key for many employees, particularly older workers. Even retired workers can be lured back into the workforce if employers are willing to adjust scheduling, she said, and work to make the situation attractive. “Not everyone wants to work 8 to 5,” she said, noting businesses are more willing these days to adapt schedules to fit workers’ needs and desires. She knows of what she speaks. Olken had been human resources director for the Maine Legislature for nine years before retiring in 2013. After that, she did some HR consulting on her own, but found she wanted a different environment. She joined KMA in 2014. Olken, who declined to give her age beyond saying she’s in her 60s, said KMA provides flexible scheduling with an environment that she enjoys. “I like people too much to work by myself,” she said. She retired five years ago from the Community Living Association in Houlton, an agency that provides support services for people with intellectual and developmental disabilities. She said retirement left her cold, so when a staffer at CLA asked her if she wanted to come back as a fill-in cook at a group home, she said yes. Driscoll works from 6 a.m. to early afternoon a few days a month, depending on whether the regular cooks are off, earning $11 an hour. Maine’s unemployment rate has remained below 4 percent for more than three years now. In January, the statewide average of 3.5 percent was even lower in Cumberland County, which at 3.1 percent was the lowest unemployment rate in the state. That puts additional pressure on hiring, especially with announcements from tech companies Wex and Covetrus that they plan to hire for hundreds of new positions once their new downtown headquarters are finished. “Employers need to have a broad array of recruitment tactics,” said David Ciullo, the chief executive officer of Career Management Associates, a staffing and recruitment company. For younger workers, he said, that might mean a company needs to have a good brand image – along with jobs posted on its website and the ability to apply in minutes on a cellphone. The companies need to be aware of how they appear on sites like Glassdoor, where workers can post reviews of their workplaces, which can be integral in helping someone decide if it’s a place where they would like to work. But older workers, Ciullo said, often appreciate an in-person experience and the opportunity to work part-time, flexible schedules if they are to be convinced to continue working or returning to work after they reach the traditional retirement age of 65. Olken said filling a job these days typically involves more active recruiting – job fairs, scouring online profiles and the like – instead of just putting up a help wanted sign, posting on an online recruitment site or running an ad. She also said that the replies are down and a job that might have attracted 70 applicants a few years ago might draw just 40 these days. But still, she said, there will be attractive candidates among those who do reply. All of that requires that employers be more adaptable than employees, Ciullo said. Community Health Options, a Lewiston-based health insurer, decided shortly after it was formed seven years ago to put some of those options in place for its roughly 160 employees. Workers who are 50 or older can move from full-time to part-time work or “buy” more vacation time through reduced pay, said Joyce McPhetres, who retired at the beginning of this year as the company’s vice president and chief human resources officer. Prior to her retirement, she spent a year working three days a week to ease her transition, McPhetres said. The company’s goal was to keep experienced workers on the job while also smoothing the transition to retirement for the business and the employee. “We decided to keep people from having to walk that cliff” to full retirement, she said. “It’s a way to balance what’s happening in their lives” with work. 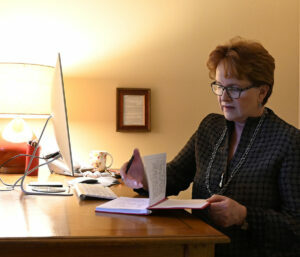 Only about five employees have taken advantage of the choices, McPhetres said, but she thinks other Maine employees need to consider doing what they can to keep more workers on the job after they hit their 50s and 60s. “In advance of finding themselves in a situation where they’re unable to find the workers they need, it’s absolutely critical,” she said. Glenn Mills, the chief economist at the Center for Workforce Research in the Maine Department of Labor, said it is the nature of a labor force to change, and churn is to be expected. “Young people reach working age, older people retire, some take time out to gain an education or work credential or to raise children, and then return to work,” he said. Over much of the last decade, however, fewer people have been entering the Maine workforce than have left, creating an imbalance and contributing to the state’s labor crunch. But Mills said many people misinterpreted the Maine Department of Labor forecast of only 100 net new jobs by 2026 to mean that there will be virtually no job openings and no one to fill them for much of the next decade. The forecast, he said, relates only to net job growth; there will still be job openings, as people move from job to job and new opportunities are created. A recent Department of Labor report on the influences affecting Maine’s labor force singled out the impact of senior workers – both in staying in the labor force longer and the potential of being wooed out of retirement to fill openings. Also, since 2014, more Mainers have died than are being born, creating a vacuum in the state’s workforce pipeline. 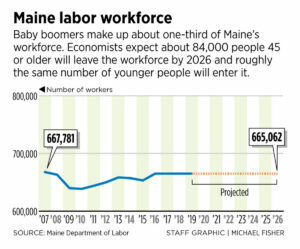 Currently, baby boomers make up about one-third of Maine’s workforce. Despite reaching retirement age, many are expected to continue working, a trend Mills said he expects will help stabilize the workforce through 2026. That’s not to suggest that meeting the state’s workforce needs will be easy, Barbara Babkirk said. Babkirk, founder of Heart at Work, a Portland career counseling and outplacement service, said she specializes in working with baby boomers, the huge generation of more than 75 million Americans born in the post-World War II years. Although most are at or near retirement age, she said, many are not ready to stop working, which would help the state forestall a drop in the size of the workforce. She’s set up a division of her company to cater to the employment needs of the soon-to-be or recently retired workers called The Boomer Institute. Babkirk said it includes a website with profiles of older job seekers, but so far no one has been hired from the site. That’s likely to change as the labor market tightens even more, Babkirk said. Making the connection between older workers and employers can still be difficult. Even though the need for workers is acute, Maine businesses seem reluctant to change their hiring procedures and work conditions to accommodate older workers, Babkirk said. “They can be a resource and it requires a different mindset,” she said. The potential employees also need assistance to be steered in the direction of a job, Babkirk said. Mills said changes in the nature of work will help many continue working after they reach the age where, in past generations, most have retired and relied on Social Security and pensions to get by. Technology will make it easier for older workers to stay on the job, he said. And automation has eliminated many of the repetitive tasks of work and other changes have reduced or eliminated the physical demands of some jobs, he said, making it easier for older workers to stay on or return to the workforce.